With a surface area of over 91,000 m2, the largest shopping centre in the Małopolska region offers 270 shops, cafés, restaurants and other facilities. Bonarka is to become an alternative city centre: all of its squares and alleys have names and glass roofs, designed to allow huge quantities of natural daylight. Eight dozen or so natural palms got tongues wagging even before the mall was opened. The man behind Bonarka is Sandor Demjan, the president of TriGranit, a self-made businessman and innovator who gained his experience back in communist Hungary by introducing harbingers of the open market. “Bonarka is a very important project to me. As a Central-Eastern European, I am proud that my acquaintances from London speak enviously of our new centre,” says Demjan. The mall itself is only the first of three stages in the Bonarka project’s development. The near future also involves the construction of modern, top grade office buildings in 2010 and residential apartment complexes in 2011. The cost of the first stage’s execution was over 330 million euro, with the entire investment estimated at 500 million euro. “The fact that in spite of the world crisis the investment remained uninterrupted proves the rank of our city,” says Mayor Jacek Majchrowski. “Completing this project meant a lot to the city. The area around Bonarka used to be the most polluted in Krakow, and now 5,000 new jobs have been created. This will surely influence the decrease of unemployment in the region,” says the mayor. The project’s execution included the restoration of a 19-hectare area of degraded post-industrial space into a modern, urban area in the Podgórze district. Since the end of the 19th century, the Bonarka area has accommodated a cement factory, and in 1948 it was replaced by the Bonarka phosphorous fertilizer state plant, later renamed the Bonarka Chemical Works. The plants were ultimately closed in 2003, however, years of negligence and over-exploitation led to the deterioration of the vicinity. The thorough land reclamation that followed was one of the largest – if not the largest – reclamation processes following the closure of an industrial plant in Poland. Costs incurred by the investor, amounting to 11.6 million euro, included deconstruction works, liquidation of about 210,000 tons of calcium fluoride waste tanks, and the extension of the water, sewage and transportation systems around the centre. 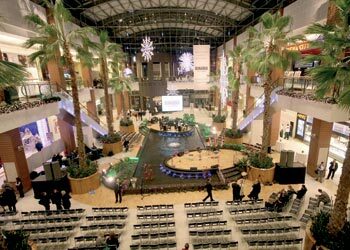 But Sandor Demjan wants Bonarka to be something more than a big mall. During the grand opening the mayor received a batch of 100 złoty vouchers for 2,000 underprivileged children from Krakow-based NGOs and welfare associations. The amount was funded by Demjan himself, and his lease-holders from Bonarka. The owner of TriGranit has already supported many charitable institutions in this area. It was his idea to include a branch of the U Siemachy association in Bonarka, which operates in the Małopolska region and maintains social therapy centres for “difficult” youth. The 400-square-metre U Siemachy seat in Bonarka will open in 2010. The investing companies at Bonarka have already donated huge sums to underprivileged children, funding holidays in Hungary and Christmas gifts for children from poor families and co-financing the purchase of a bus for U Siemachy. “We want Bonarka to be perceived as a centre that is friendly to children, which is why we decided to dedicate these funds for kids,” says Dariusz Rudziński, BCC Managing Director. “Mr Sandor Demjan, the owner of TriGranit company, which is the co-owner of the Centre, supports that gesture. His motto is that a businessperson must look beyond making money and should be sensitive and open to people,” adds Rudziński.